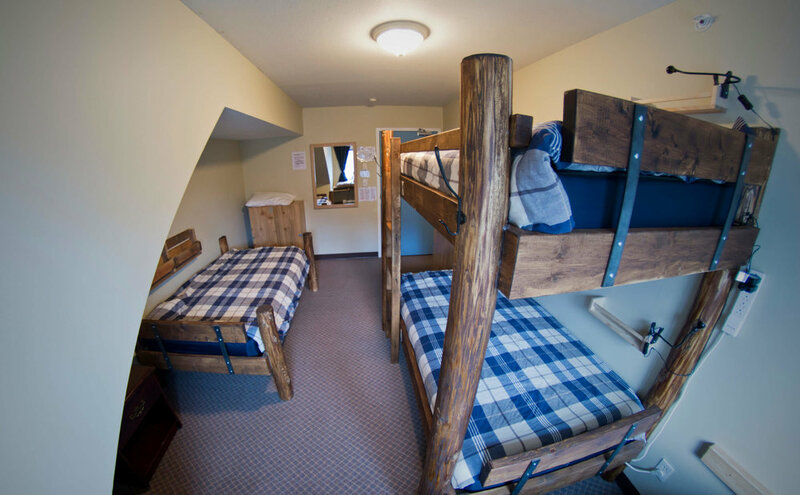 3-6 bed in shared dorm rooms. Each bed has a private shelf, light, and locker. Female-only available on request. Private hostel-style rooms. Sheets are provided, but you make your own bed. Shared bathrooms are on the same floor, and select rooms have ensuite sinks. Hotel-style rooms with ensuite bathrooms and private outside ground floor entrances. Towels and linens are provided and each room has satellite TV. Free WiFi is available and you have complete access to our fully equipped kitchen, shared lounge, reading room, and patios. Sheets provided... but you make your own bed. Young children are not permitted in shared rooms, but are in privates. Sheets provided... but you make your own bed. Towels can be rented. Please be aware that these rooms are on the highway side of the building, so you will hear traffic noise, especially when the windows are open. Sheets provided... but you make your own bed. Towels for rent. Located on the quiet, water and mountain side of the building. Some rooms have 1 or 2 person futon couches for added occupancy (at additional cost). Please inquire directly with us if interested.